SHAH’S NEWSAGENT, in the Shawlands district of Glasgow, is firmly shuttered now. But the spirit of the man who ran it until his murder on March 24th lingers on in the hundreds of floral tributes that carpet the pavement outside. The “kindest, sweetest man”, says one card. Tellingly, there are also heartfelt messages from the local Methodist Church, a “Christian brother” and a “Jewish couple”, for Asad Shah was a Muslim, a member of the Ahmadiya sect, and a man who by all accounts believed firmly in embracing people of all faiths. Indeed, he had become something of a local celebrity for this, “a quiet man with a loud message” in the words of another mourner. And for this he might well have been killed as well. Mr Shah was found with multiple stab wounds outside his shop on the evening of the 24th and died in hospital. On March 29th Tanveer Ahmed, a 32-year-old from Bradford, in the north of England, appeared in court charged with the murder. Mr Ahmed, it is thought, is a Sunni Muslim. 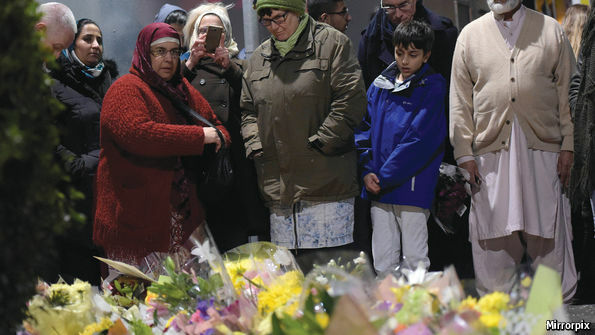 The murder has not only shocked the local community but has also provoked fears that a particularly vicious split among Muslims worldwide has finally arrived in Britain. Scotland, however, has prided itself on the lack of extremism among its 80,000 or so Muslims, so the authorities will be straining to ensure that Mr Shah’s death remains an isolated incident.The Ahmadi consider themselves Muslims but differ from the mainstream in that they believe Mirza Ghulam Ahmad, the 19th-century Indian who founded their tradition, was a latter-day prophet. In many Muslims’ eyes, this makes them un-Islamic and blasphemous. Pakistan’s Ahmadis, of whom there may be 4m, were declared to be non-Muslims by the government in 1974 and they have been subject to harassment and worse ever since. In effect, their faith has been criminalised. In 2010 gunmen entered two Ahmadi mosques in Lahore and killed 95 worshippers. Ahmadis have also been victimised and killed in Indonesia in recent years. There are about 25,000 Ahmadis in Britain, organised in 150 chapters across the country. Their first mosque was built in London in 1926. Perhaps 400 Ahmadis live in Glasgow. Until now, the Ahmadis report that relations with other Muslims have been generally good, although Abdul Abid, an elder at the Ahmadiya community centre in Glasgow, where Mr Shah worshipped, says that some of the sectarianism of Pakistan has always spilled over into their lives in Scotland. Certain Muslim-owned shops, for instance, will not stock goods produced by Ahmadiya communities. More importantly, says Mr Abid, certain imams have stoked hardline worshippers against the Ahmadiya and Muslim satellite channels have carried anti-Ahmadiya messages. Against this background some Ahmadis fear that Mr Shah’s murder could provoke others to attack them. “Intolerance breeds intolerance,” says an Ahmadiya leader, “so we want this problem nipped in the bud.” The Ahmadis have been trying to promote a positive image of Islam in Britain, running adverts on buses proclaiming “United against Extremism”, for instance. Now they want mainstream Muslim leaders to condemn unequivocally the same extremism that has very probably led to what the police describe as the “religiously prejudiced” murder of Mr Shah. Muslim leaders in Scotland have condemned the “outrageous, violent attack by one individual on another”, but that has not been enough for some Ahmadis. The local mosques and imams were invited to the Glasgow Ahmadiya centre on the morning of March 30th to show their solidarity with the grieving Ahmadis and to sign a joint statement. None came. It was “disappointing, an opportunity lost,” says Mr Abid. He accuses the imams of hypocrisy, of saying nice words but of failing to take a real stand together with the Ahmadis against extremism. One Muslim group has been accused of posting messages online gloating over Mr Shah’s death. “Love for all, hatred for none” is the slogan Ahmadis try to live by, and it seems to have inspired Mr Shah. Perhaps his death will help that message to prevail in the coming weeks and months. Share the post "A quiet man with a loud message"